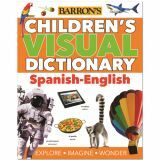 This fully illustrated bilingual dictionary make learning a second language fun. Defines over 1000 words in ten different categories that cover people, food, animals, entertainment, and more. 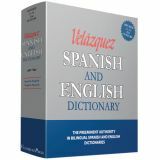 Each word is presented in Spanish and English, and includes a full-color picture, lively scene, or labeled diagram that makes its definition clear. A fun and easy way for young language students to expand their vocabulary and broaden knowledge. 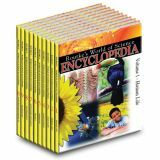 Rourke's World of Science Encyclopedia teaches the essential concepts for elementary school science instruction. This comprehensive set helps students with the transition from K-4 to 5-8 grade level studies. From basic objects in the sky, life-cycles, and properties of earth materials to the more advanced, structures of living systems, forces and motion and science technology, students will find what they need. Make Rourke's World of Science Encyclopedia an important part of your reference library. 10 volume set includes: Vol. 1 El Hombre, Vol. 2 Los Animales, Vol. 3 Las Plantas, Vol. 4 La Tierra, Vol. 5 La Quimica, Vol. 6 La Fisica, Vol. 7 Astronomia y el Espacio, Vol. 8 Las Matematicas, Vol. 9 La Tecnologia, and Vol. 10 Proyectos de Investigacion. 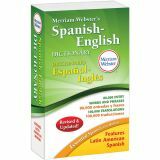 A resource especially for students in grades 4-8 learning Spanish or English. Bidirectional more than 50,000 translations include variants, inflected forms, common phrases, synonyms, and definitions. An appendix with detailed pronunciation guides to the English words, including IPA, helps English learners speak the language. Grades: 5-12, Ages 10-17. Hardcover, 496 Pages. 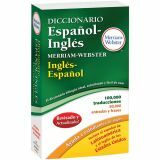 This dual language dictionary includes more than 100,000 translations in English and Spanish and is designed specifically to meet the needs of ELL students from 3rd to 12th grades. This tool is inclusive of approximately 15,000 Content vocabulary words in Science, Math, History, Geography and also Literary key terms! 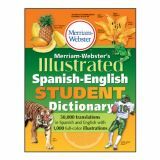 This word-to-word dictionary is recommended for classroom instruction and State testing. 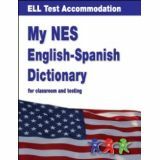 NES Word to Word Spanish and English School Dictionary was written especially for native Spanish speakers to use and communicate in the classroom. 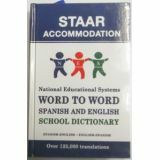 The word-to-word format also allows students to use NES Word to Word Spanish and English School Dictionary in state standardized testing as accommodation or variation. It cover Language Arts, Math, Science and Social Studies terms from 3rd to 12 grade. 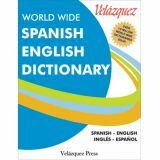 Over 12,000 word to word translations including academic terms frequently used in school but not found in regular dictionaries. User friendly entries to help students find the translation easier. 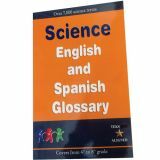 NES presents the New English-Spanish Glossaries in the areas of Math and Science. 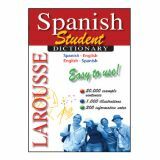 The dual language glossaries are an excellent resource for newly arriving students to the United States that need support in the native Spanish language. The emphasis is on key vocabulary terms that are TEA recommended in the areas as they pertain to each subject category. They are intend- ed for classroom instructional support and at-home use for both homework and the parental connection. 48,000 entries and colored headings for easy word search. Easy-to-read font, bold guide phrases, and intuitive phonetic spelling. Modern scientific terms to meet today's classroom demand. Complete listing of Spanish verb conjugations, both regular and irregular. Paperback, 640 Pages. 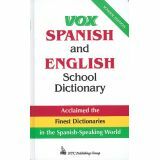 The VOX Spanish and English School Dictionary is a practical reference, edited to serve the classroom needs of beginning and intermediate students-either English speaking students of Spanish or Spanish-speaking students of English. Paperback.